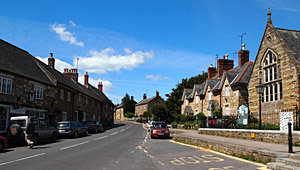 Abbotsbury village is a picturesque huddle of honey-coloured stone cottages; many thatched with reeds from the nearby Fleet lagoon. The village grew up around the nearby Benedictine abbey, which prospered for centuries before its dissolution in 1539. Very little of the abbey buildings remain, except for the chapel and a huge tithe barn with impressive buttressed gable ends. Abbotsbury's main street has that charming quintessentially English feel, lined with old inns and lovely little tea shops. Much of the medieval masonry from the abbey has ended-up in the walls of the village houses and cottages. 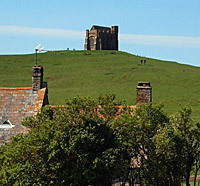 Visible high on a hill just behind the village is St Catherine's Chapel, once an important seafarers' landmark. The panoramic views from the chapel are well worth the short steep climb to the top. The village is also famed for its Swannery. Swans were once considered a table delicacy and were bred here as long ago as 1393 to provide food for the monastery. A mile south of Abbotsbury sits the vast shingle Chisel Bank, that stretches from the edge of the Swannery towards the Bill of Portland in the east. The Fleet, a narrow lagoon, runs for some 8 miles between the shingle bank and the mainland. The abbey site is dominated by an impressive 276ft long tithe barn, located at the bottom of the hill behind the village. The tithe barn and gateway is all that survives from the medieval Benedictine monastery that once stood here. The nearby 15/16th century church has a pulpit bearing the marks of Civil War bullets. The austere little Chapel of St Catherine (the patron saint of spinsters), stands prominently on the aptly named Chapel Hill, located between the village and the sea. The chapel was built during the 15th century by devout monks from the abbey and has a remarkable stone roof. Visitors to the chapel's exposed summit are rewarded with spectacular panoramic views across the surrounding rolling countryside and out over the English Channel. Garden-lovers should not miss these beautiful tropical style gardens, located just one mile west of Abbotsbury. Seventeen acres of walled grounds enclose a large collection of rare trees, shrubs and plants, especially magnolias and camellias, which flower here a little earlier than normal. This ancient Swannery was established by the monks from the abbey, and has remained on this site for over six centuries. It is now the largest remaining Swannery in England and provides a secure breeding ground for hundreds of mute swans and other species of wild fowl.